The REXIS science objective is to obtain an X-ray (0.3-7.5 keV) global map of the elemental abundance of the asteroid 1999 RQ36, thereby providing a complementary understanding of the globally representative context of the returned sample. 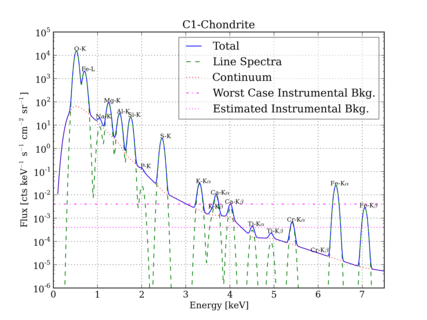 Shown right is a simulated X-ray fluorescence spectrum from regolith of a C1 carbonaceous chondrite for the quiescent Sun for the REXIS instrument with the asteroid at a heliocentric distance of 1 AU. Increased solar activity can increase fluxes by 2 to 4 orders of magnitude over those shown. 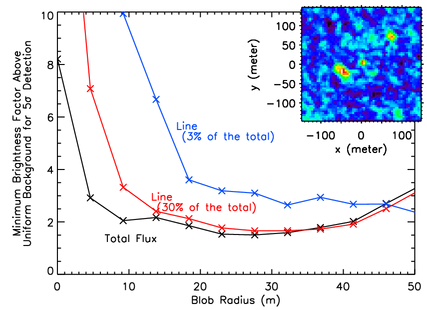 The bottom panel shows the minimal detectable (5 sigma) excess of a high concentration surface unit vs. unit radius (m) for the total flux (black) and a lines constituting 3% (blue) and 30% (red) of the total flux (c.f. 1-40% of the total for the 5 brightest observable fluorescence lines). The inset shows a simulated image from 700m of a region containing three units with factors of 5, 6, and 10 higher concentration of O than the surrounding region reconstructed with the preliminary random mask design.